Eloy was renovating a condo outside of Orlando. The rental market was hot and he thought the unit would be a great side-project and investment for the long term. He even had a tenant ready to rent as soon as things were ready. At the last minute, he decided the color of the entryway was far too muted and boring for the sunny community around the condo. He went to a hardware store and bought a glossy, citrus-colored paint. “It’s perfect,” Eloy thought. He went home and painted the entryway walls before walking outside for a glass of iced tea while he waited for the paint to dry. Only it wasn’t drying. It was just sitting on the original wall paint, still wet to the touch. If you haven’t chosen the proper paint, it might not adhere to the substrate. Have you ever seen paint that doesn’t stick to the substrate? It actually doesn’t look much different than paint that does stick…right up until the point where you wipe it with a rag or bump in to it. Then the paint comes right off, still wet to the touch. To get an idea of how non-sticking paint behaves, take a balloon and try to write on it with an ink marker. The ink will sit on the balloon but never stick to the surface, meaning you can wipe off the ink with very little effort. Believe it or not, paint behaves the exact same way. If the paint you choose isn’t properly formulated to stick to the surface upon which it is being applied, you will end up wasting considerable time and money on the job itself. One of the oft-overlooked qualities of paint is its adhesive properties. Both professionals and amateurs alike understand the difference between things like color and gloss but very few people can speak intelligently about the actual stickiness of the paint itself. What makes paint stick to a surface as it’s applied, rather then drip right off? What keeps it there after it’s cured? Because paint is specifically formulated to adhere to different surfaces in different environments, using the wrong paint can mean more than just poor coverage…it can mean no coverage at all if the paint doesn’t properly stick to the substrate. And while professional painters might not ever be called on to test a paint’s adhesion on their own, it is nonetheless useful to know exactly what test methods are available to industrial and commercial paint professionals. Adhesion testing tools come in a wide variety of styles. Cross cut adhesion testing: Also known as the cross-hatch method, cross cut adhesion testing is perhaps the most common form of adhesion testing available. To perform the cross-hatch method, a knife or sharp object is used to cut through the paint to the surface below in a pattern that creates a corner edge. 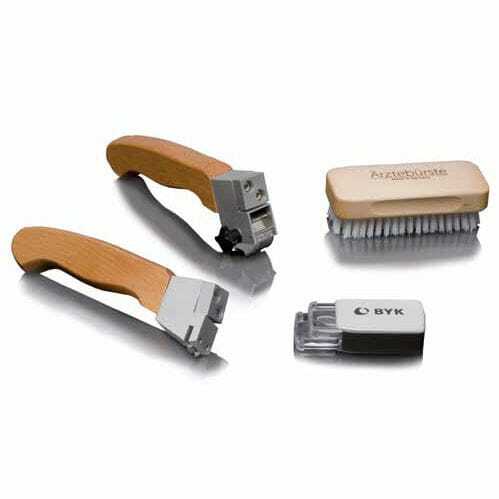 Once these cuts have been made, the tester uses the blade to try and lift the paint from the surface at the point of intersection of the hash-marks. The quantitative results of this type of testing are hard to come by; in fact, any test results are subject to the tester’s experience level and very little quantitative data. That said, cross-cut adhesion testing lets professional painters quickly confirm if a paint is sticking well to the substrate. Cross Hatch testing is a quick (though not the most accurate) way to measure adhesion strength. Image courtesy of Lakeside Painting. Pull-off adhesion testing: Pull-off adhesion testing quantitatively measures the amount of tensile stress necessary to remove the paint from the substrate. A dolly is attached to the paint surface and an increasing amount of stress is applied in an effort to separate the paint from the surface. Once the point is reached where the paint is no longer adhering to the surface, data is recorded (most often in pounds-per-square-inch) that reflects the adhesive strength of the paint in accordance with the test results. Pull-off testing yields more quantitative data for the tester. “Loop tack” testing: Stylus or “loop tack” adhesion testing occurs when a tacky substance (like tape) is formed into a loop and pressed against a surface coating. Tape is applied to a surface and then the amount of force needed to separate the tape from the surface is measured. This type of adhesion testing is great for testing glue for stickers and decals, as well as non-cured paints. Similarly, tack adhesion testing can be utilized to measure the tensile strength of the tape itself. Force is applied in an effort to remove the tape and once the tape no longer sticks to the surface, the resulting data is recorded. Testing paint adhesion is important so that products available to professional painters can be reliably used on a variety of surfaces. While the client may think the color or sheen of the paint is the most important characteristic of the coating, those qualities don’t matter if the paint won’t properly stick to the surface on which it is applied in the first place. While many professionals may never need to test adhesion in the field, it is good to know the options available to you should a situation arise where such measurement is necessary. Click here to learn more about how testing paint at the job site can help produce fantastic results!